Children have paid the heaviest price in the Syrian six-year war. It’s safe to say that children are the Syrian war’s greatest victims. Simple pleasures like holding teddy bears, eating fruit, and playing outside are only distant memories from a time before crisis began. 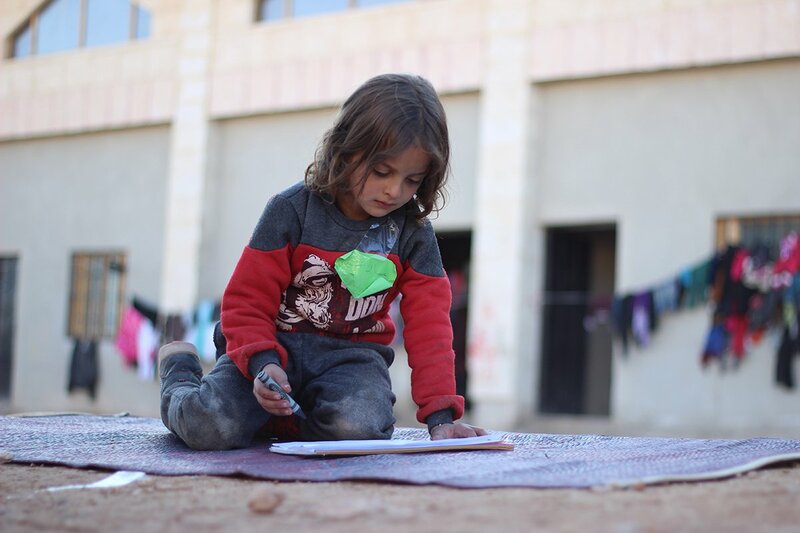 Six years of drastic violence, torture, death, and starvation have uprooted the lives of more than 1.7 million Syrian children who are out of school. Places that were once safe for them — hospitals, playgrounds, homes — have become death traps. Many have lost their parents, many more have lost their childhood. At the end of 2016, in the midst of escalating violence, a UNICEF-supported psychological support program reached over 500,000 children, and encouraged them to engage in cathartic activities, like drawing, to help them process their experiences. 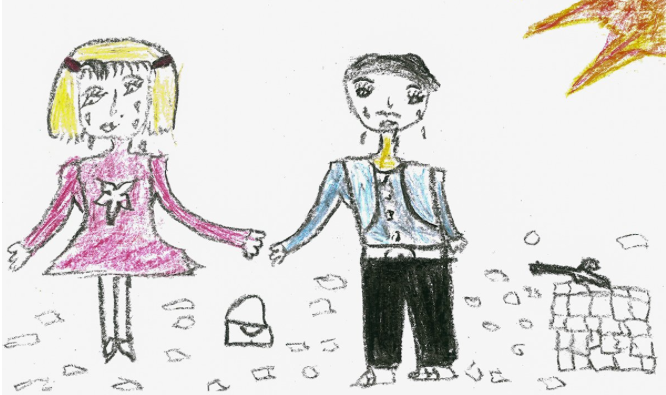 These beautiful drawings illustrate their sorrow and hope for a better future. 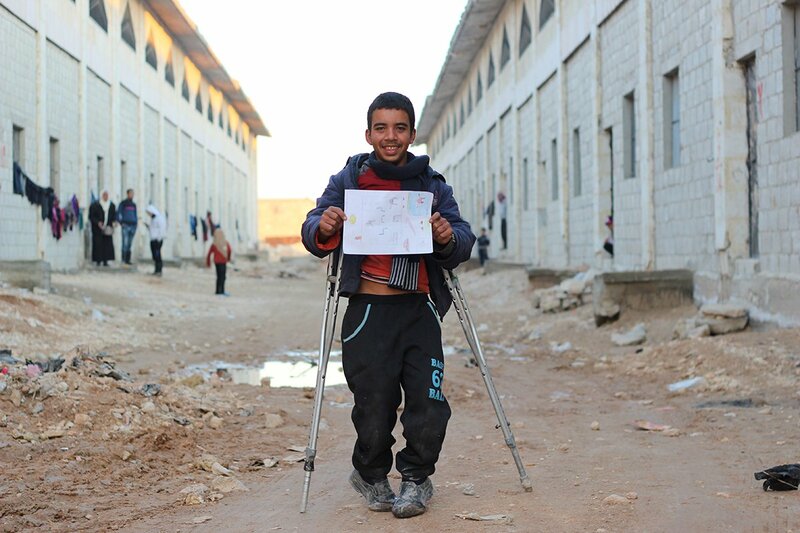 Khaled, 13, who was injured during heavy fighting in eastern Aleppo, holds up a picture he drew of a big house with a swimming pool, at a shelter for families displaced by the ongoing violence in eastern Aleppo city, in the Jibreen area on the outskirts of Aleppo city, Syrian Arab Republic, on Dec. 9, 2016. “I love sport, especially swimming. I wish I learn how to swim and be a fast swimmer,” says Khaled. Living under siege, many children like Khaled spent months hiding in dark basements or in underground rooms, lacking the safety the needed to even play. 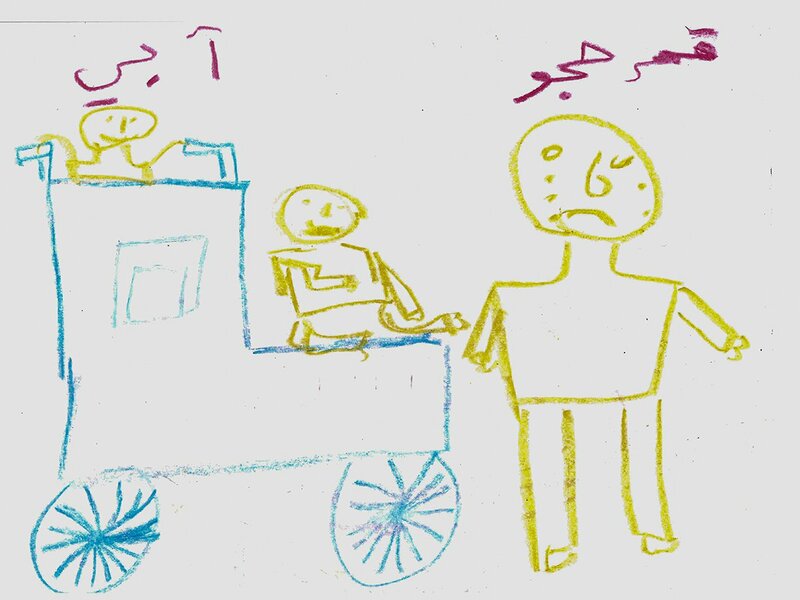 A drawing by a child who was internally displaced, Damascus, Syrian Arab Republic December 2016. Around 100 children displaced by fighting in Syrian Arab Republic attend a UNICEF supported psychosocial support programme at centres in Damascus and rural Damascus. As part of the programme, the children produced drawings expressing their hopes and fears, as well as good and bad memories. 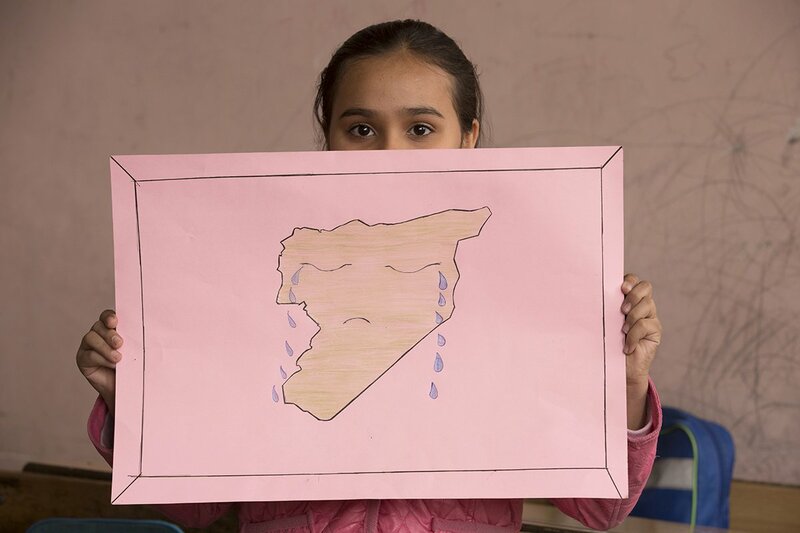 “Syria is sad that her people are killing each other,” says Haneen, 11, holding up her drawing of a map of Syria crying, at the Bakri Kaddoura school, Damascus, the Syrian Arab Republic, Nov. 10, 2016. Haneen and her family lived under the harsh rule of ISIS for almost a year in Deir-ez-Zor, northeastern Syrian Arab Republic. Last year, her family made the dangerous journey to the capital Damascus. 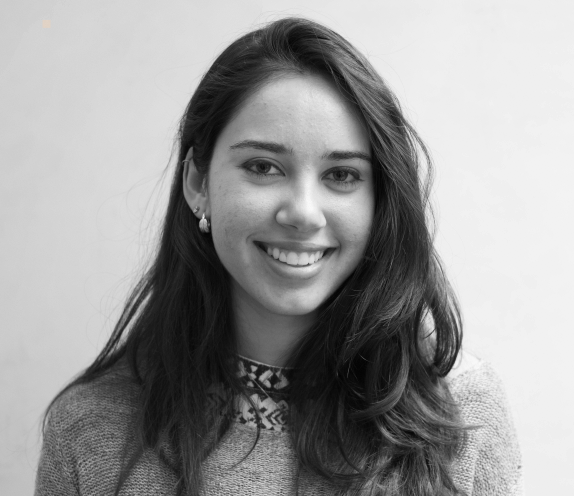 “One day we were at school when men with guns walked in and forced us out of school. They pointed the guns at us and told us to go home and never go back to school. That’s when my parents decided it’s time to leave” recounts Haneen. “I was so scared on the way that ISIS would not let us escape. We had to take a long road. I couldn’t believe it when I took off the black veil they made all girls and women wear” says Haneen. A drawing by Aya, 11, who was displaced with her family from Al-Yarmouk camp, which was home to the largest Palestinian refugee population in Syria before the war, Damascus, Syrian Arab Republic, December 2016. Aya’s father left Syria for Egypt to work and provide for the family almost five years ago and Aya hasn’t seen him since. 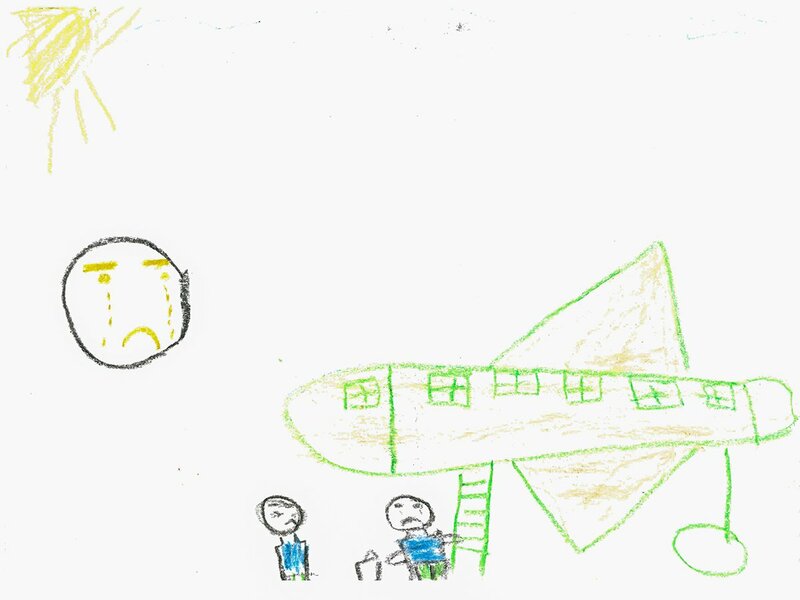 “I drew myself seeing my father off at the airport, it’s my saddest memory. I look at a photo of him every night so I don’t forget what he looks like,” says Aya. Shadi, 11, holds up a picture he drew at a shelter for families displaced by the ongoing violence in eastern Aleppo city, in the Jibreen area on the outskirts of Aleppo city, Syrian Arab Republic, on Dec. 9, 2016. “I drew many types of fruits like bananas, oranges and mandarin. 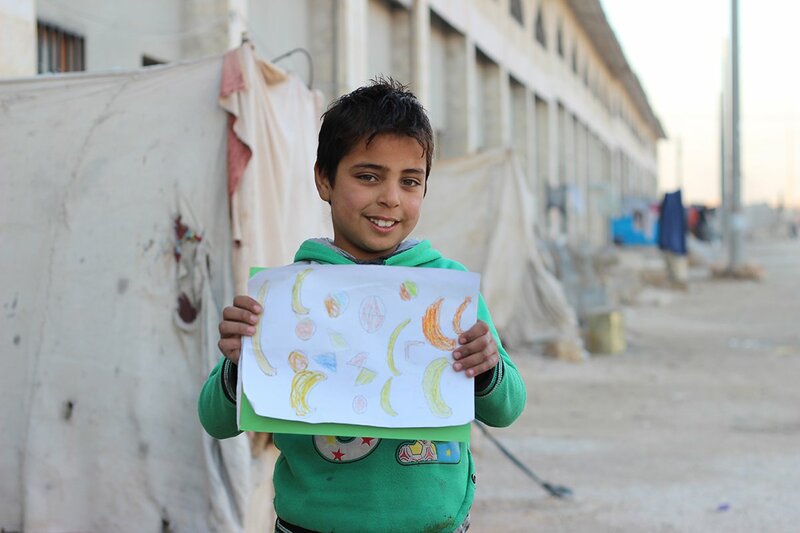 It has been a very long time since I ate fruit,” says Shadi describing his drawing. Shadi is one of the thousands of children who fled the recent waves of fighting in eastern Aleppo city. After months of living under siege with little food, hiding in basements too scared to go to school or play outside, many of the children are now just happy to be outside and play. 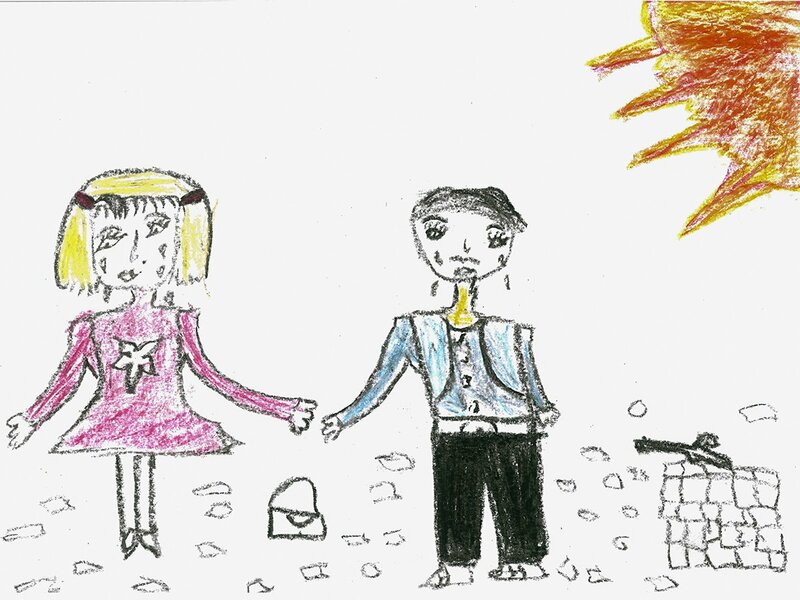 A drawing by Amar, 12, who was displaced with her family in 2012 from Al-Yarmouk camp, which was home to the largest Palestinian refugee population in Syrian Arab Republic before the war, Damascus, Syrian Arab Republic, December 2016. After Amar’s two brothers disappeared, her father suffered a stroke, rendering him unable to move or speak. “This drawing shows my mother pushing my father on his wheelchair and me crying besides them. It makes me so sad to see my father unable to do anything on his own. I miss him talking to me,” says Amar. 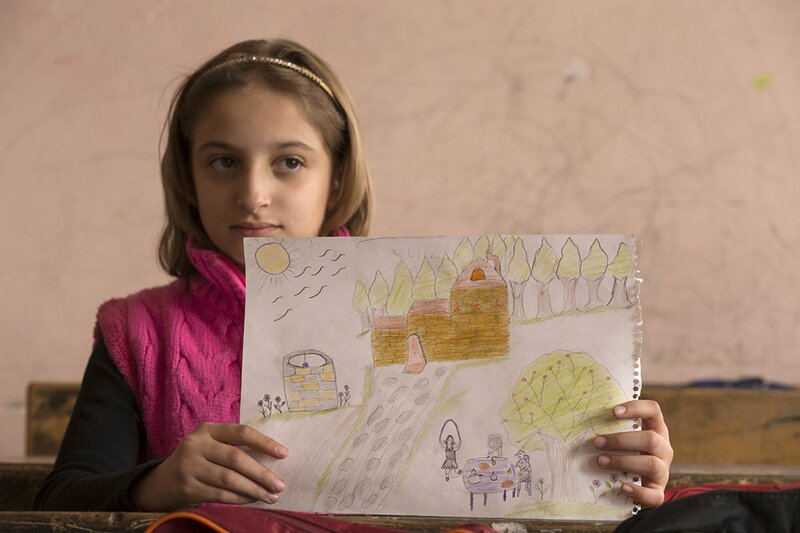 Ghazal, 10, who attends grade 5, holds up a picture she drew of her life before the war began, at the Bakri Kaddoura school, Damascus, Syrian Arab Republic, Nov. 10, 2016. Ghazal fled her home in Al- Tadamon, a neighbourhood south of the capital Damascus, when violence started almost four years ago. “I remember my room, it was all white and so big,” she said. “I miss this really big red teddy bear I received from my cousin on my birthday, I left it back home.” Ghazal and her family now live in Al- Mazzeh neighbourhood of Damascus. 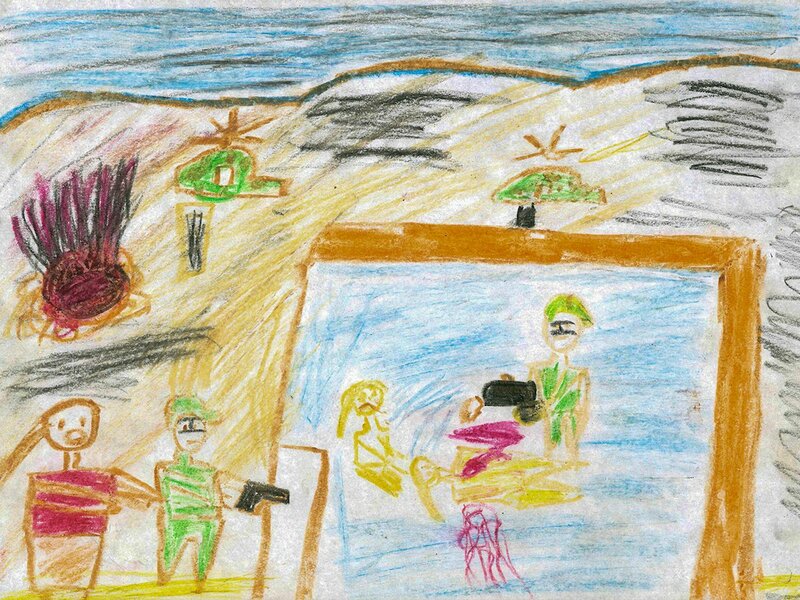 A drawing by Myassar, 14, who was displaced with his family in 2012 from Al-Yarmouk camp, which was home to the largest Palestinian refugee population in the Syrian Arab Republic before the war, Damascus, Syrian Arab Republic, December 2016. “I drew myself and my sister crying when my father left us almost two years ago. We don’t know anything about him. This is my saddest memory,” says Myassar. Ammar, 6, draws at a UNICEF-supported child friendly space at a shelter for families displaced by the ongoing violence in east Aleppo city in the Jibreen area, on the outskirts of Aleppo city, Syrian Arab Republic, Friday 9 December 2016. “My shoes are always dirty here because it is muddy and unclean," says Ammar of the shelter. 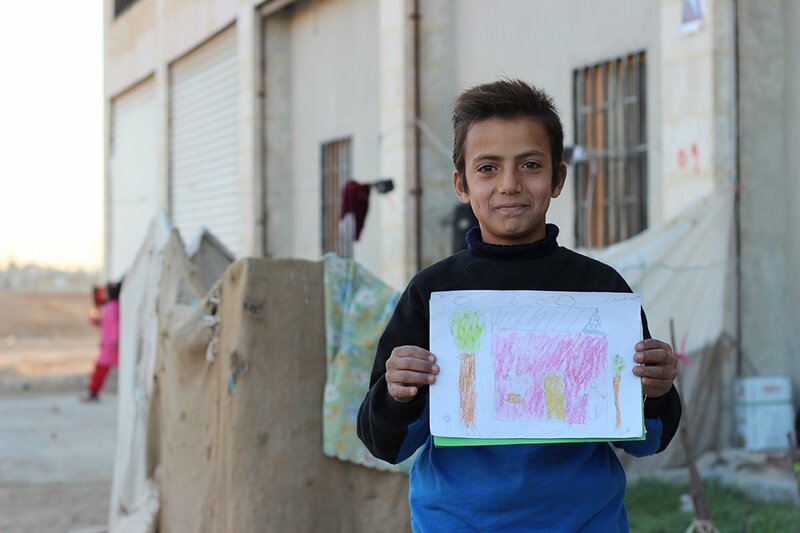 “I want a house with walls and two windows and a door,” says Abdulmajeed, 13, holding up his drawing, at a shelter for families displaced by the ongoing violence in eastern Aleppo city, in the Jibreen area on the outskirts of Aleppo city, Syrian Arab Republic, Friday 9 December 2016. Abdulmjeed arrived ten days ago at one of the shelters in Jibreen. Conditions at the shelter are basic with little protection from cold and rain.